We previously posted the recipe for Orange Spoon Sweet and this is the recipe for a spoon sweet with firikio apples. I haven't been able to find the English word for firikio, but they are small, tasty apples - you can see the ones we picked in the photo at the bottom. 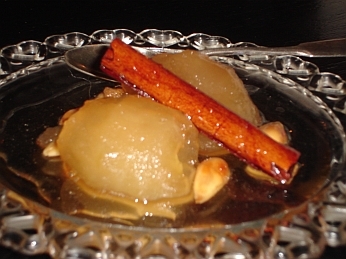 As I mentioned previously, it's common practice in Greece if you visit someone during the day or early evening, to be offered a spoon sweet, or 'gliko koutaliou'. This is a sweet made from fruit and kept in a jar, to be served on sweet dish (preferrable glass) whenever someone comes. The recipe below has 2 kg of sugar, but some people use less. You can try it and see what suits your taste. It's really easy to make and is a delightful sweet to eat. Peel the apples and core them so that they are still whole but there is a hole through the middle. 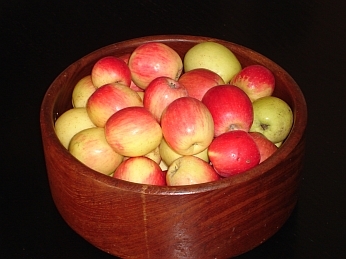 Place the apples in a bowl of water and add the lemon juice. In a pan boil the sugar with the water and the glucose. As soon as it comes to the boil and the sugar has dissolved, add the apples, cinnamon sticks and cloves. Continue boiling the mixture, removing the froth every so often, until the syrup has formed. After about 30 min. you can check the apples with a fork and if they are cooked and the syrup has formed, you can remove from the heat. Let it cool, remove the cinnamon sticks and cloves and fill in the hollow core with almonds. Put the mixture in a large glass jar, ready to serve whenever you wish. looks delicious never try to eat this food, anyway love the bunches of apples! I'm looking for sweets to add up to my barbecue rib recipes. And I think a twist of Greek will make our upcoming Christmas celebration very multi-cultural. Thanks for sharing!